As the centenary of the end of the First World War approaches, we are delving into our collection looking at some of the fascinating wartime documents we look after. Join us on Saturday 10th November 2018 to mark 100 years since the Armistice at ‘Is this really the last night?’ Remembering the end of the First World War. Gerald Rickword’s advice to ‘Never look backward, always look ahead’ appears on his sketch of a First World War soldier whose gaze is set firmly on the drinks at the bar in front of him. While never looking back is not advice that we could advocate at the archive, it must have been one way of coping with life on the Western Front, where Rickword was based when he made the sketch. Gerald Rickword was born in Colchester in 1886, the second of four children. His brother John Edgell Rickword also served in the war, and is the better known of the two. John Edgell was a poet, critic and journalist, and in the 1930s became a leading communist intellectual. Both were the sons of George Rickword, who was Colchester Borough Librarian, and attended Colchester Royal Grammar School. In later life Gerald maintained a lifelong interest in Colchester’s history. Before the beginning of the First World War, Gerald was an insurance clerk. During the war, he served first with the Royal Berkshire Regiment, and then with the Labour Corps as a transport officer. It was during this period that Gerald drew the sketches shown here. A collection of about 30 sketches made by Gerald during the war survive today at the Essex Record Office, each full of evocative little details that provide windows into scenes that Gerald witnessed. The sketches are all in pencil, and most are monotone, with just a few in colour. The sketches are all loose, and on scraps of various paper stocks. Some of the sketches show men of different nationalities and regiments observed by Gerald. One of these is dated 8 January 1917, and shows different soldiers Gerald had seen on the Boulevard Jacquard (he doesn’t give a town, but this could perhaps be the Boulevard Jacquard in Calais). One head and shoulders sketch is of a French Algerian soldier, while a full length portrait is of a French cavalry officer. The sketch is in black and white, but for the cavalry officer Gerald has noted the colours of his uniform – a red hat, a light blue tunic, red breeches, and red cloak lined with white. Several of the sketches are humorous, such as ‘A portion of the rear of the British line’, showing a rear view of a rather wide British soldier, his uniform straining around him. In another sketch, two mice help themselves to cheese and crackers. In another, a sentry stands in driving rain, his jacket buttoned up over his face, a large wide-brimmed hat hopefully ensuring he didn’t get rain water pouring down the back of his neck. The caption informs us that despite appearances, this man is ‘A Sentry, not one of the Lifeboat crew’. Other sketches are more haunting, such as the one of a soldier in a gas mask. After the war Gerald returned to Essex, and in 1923 married Florence Webb in Colchester. He lived until 1969, when he died aged 82. More of Gerald’s sketches will be on display at our Armistice event on Saturday 10th November 2018, ‘Is this really the last night’? Remembering the end of the First World War. Find full details and booking information here. Also on 10th November, we will be at Chelmsford Library in the morning running a drawing activity for children based on Gerald’s sketches – find the details here. First World War stories from ERO’s collections will also be featuring in a remembrance concert at Chelmsford Cathedral in the evening of 10th November – find the details here. 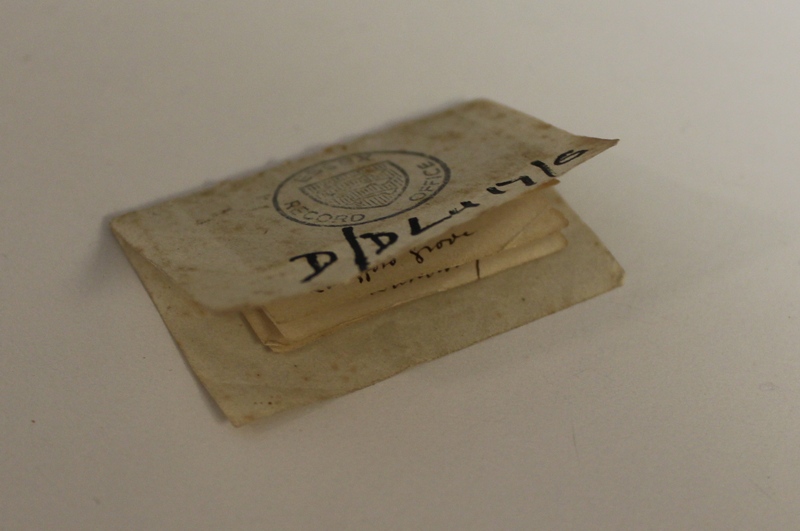 Could this be our smallest document? D/DLu 17/6 is definitely very small. 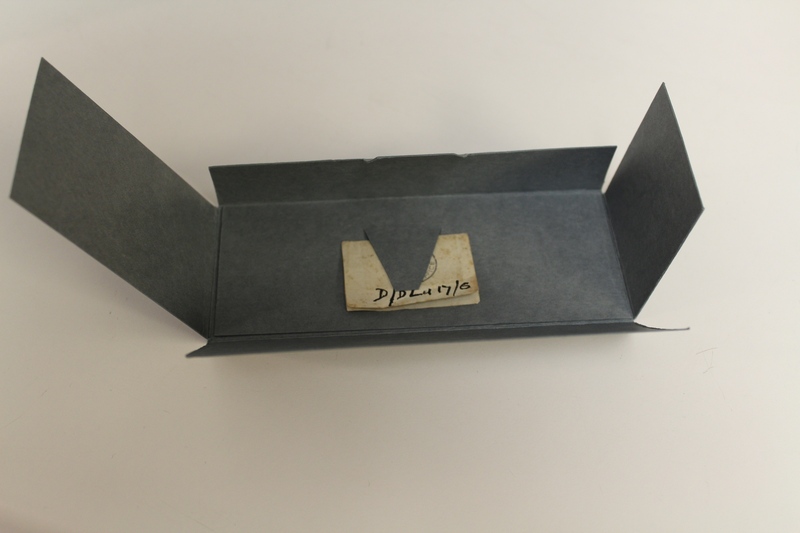 D/DLu 17/6 measures just 36 x 26 mm and is so small that we have had to construct a special folder to keep it safe and to make it harder to lose. 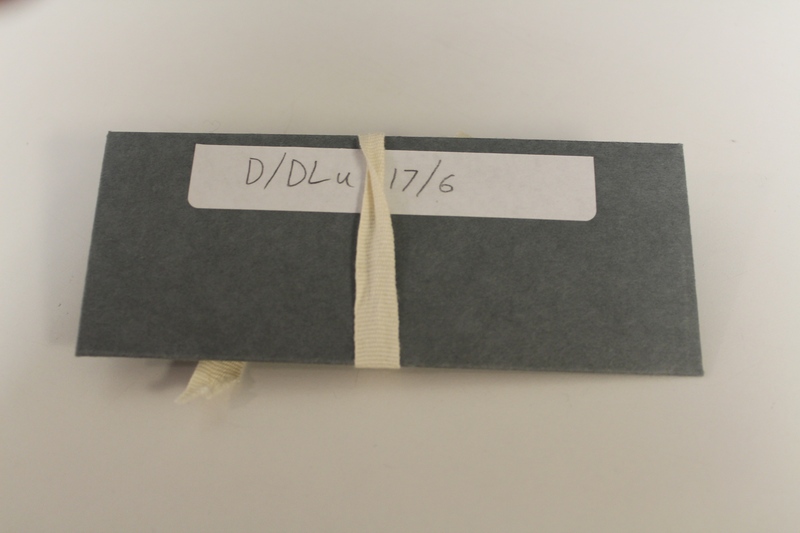 D/DLu 17/6 in its specially made folder. All wrapped up and ready to go back into storage. The larger folder certainly makes it easier to keep track of. 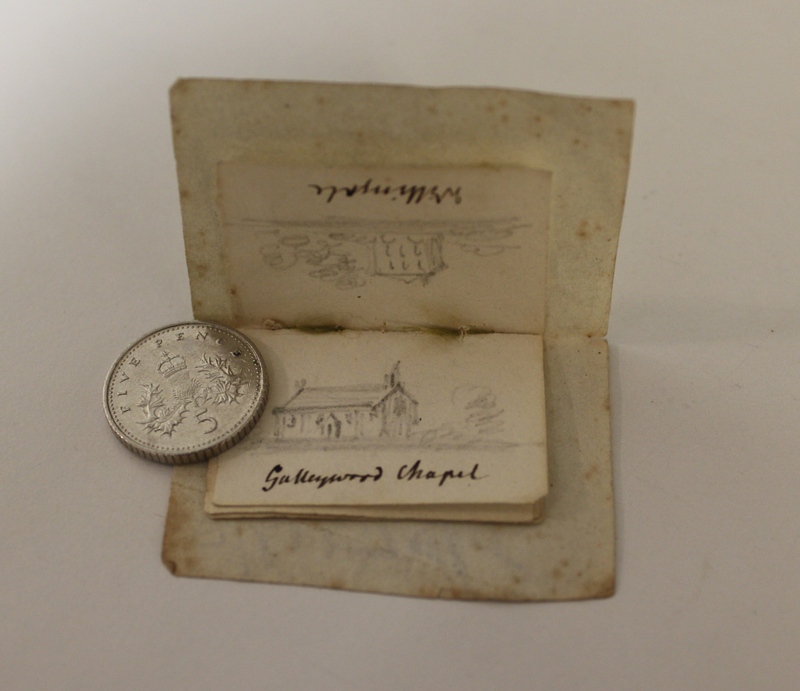 D/DLu 17/6 is a tiny sketchbook created by Clarissa Sandford Bramston [née Trant] who was married to the Reverend John Bramston from 1832 (vicar of Great Baddow, 1830-40; vicar of Witham, 1840-72; Dean of Winchester, 1872-1883). It is impossible for us to know when the document itself was created other than to say it must have been created before 1844 when Clarissa died. Perhaps someone with a strong magnifying glass and an interest in Essex architecture may be able to suggest a date? Galleywood Chapel which pre-dated the church before it was a parish in its own right. The sketches show several churches, chapels and houses of Essex and a rather attractive view of Danbury, all in a surprising amount of detail for its diminutive size. 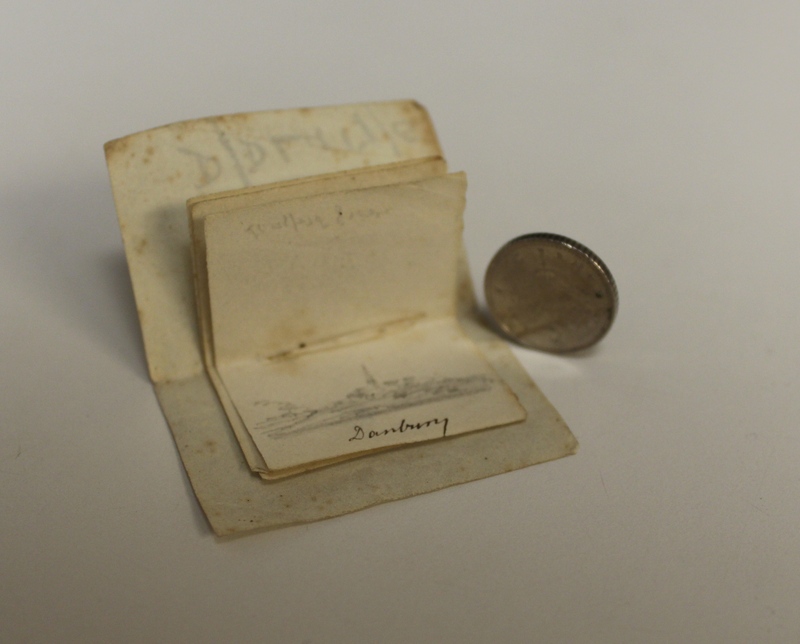 Alongside this miniature sketchbook, Clarissa also left us several other documents of more reasonable size, including her journals and diaries running from 1800 right up until her death in 1844 and numerous other scrapbooks, recipes and items of correspondence, all of which are part of the Luard and Bramston deposit (catalogued as D/DLu).